Today I want to go over a trio of related weapons that were all affected by a change made to the Medic’s base regen during the Tough Break Update. 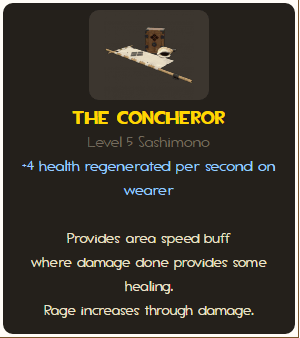 As you can see, the description to the Concheror claims “+4 hp regenerated per second” but what actually happens is that you start regenerating at 1 hp and that number gradually increases to 4 the longer you go without taking damage. The Cozy Camper and the Amputator are identical, except that the Amputator stops at 3. I thought I’d talk about what this means for each weapon, because it’s interesting to compare the adjustments to their former stats. It’s hard to say whether this counts as a nerf or a buff for the concheror, which previously regenerated a flat 2hp/second. It’s arguably less useful in sustained combat now, but it can be stacked with other regeneration sources such as the Black Box, Half-Zatoichi, and the Concheror’s own bugle meaning that a soldier who uses his mobility and staggers skirmishes can easily milk the benefit of the enhanced regen. It’s important to note that any sort of damage resets the regen back to 1, meaning that it might be difficult for constantly rocket-jumping soldiers to milk this weapon for its maximum benefit. Even Soldiers who use the Rocket Jumper often take fall damage at the end of a jump. I’d say in general that I like the new Concheror more because it encourages smart play, rewarding faster health regeneration to the patient player who chooses to tactically delay re-entering the fray. It also synergizes quite well with the aforementioned Half-Zatoichi, ensuring that you can eventually sheath your weapon even if you find yourself holding it with no hope of kills or health packs in the near future. While it locks the Soldier into a certain ground-based playstyle due to being affected by self-damage, it does shine at enhancing that specific playstyle while coming with clear downsides. This goes double for the Cozy Camper, where this change is a more straightforward buff, considering it prevously healed 1hp/second and stayed that way. Sniper traditionally fights classes well out of their comfort zone and selectively chooses who he wants to engage, meaning he can easily reach +4 regen without even noticing. However, since most of his counters specialize in one-hit-KOs it’s really most effective against classes he already carries an advantage over. It works best with non-stock playstyles, such as frontline snipers who typically encounter more varied foes in the line of duty. It also for the most part will not protect you against being ambushed; almost every class can kill a distracted sniper in two hits at close range, and the lack of a real secondary means the sniper is missing any sort of emergency self-defense weapon, so positioning again becomes an extremely important skill to have. Sniper has always been a traditionally lone wolf, so a self-healing weapon comes with some very appreciated and obvious upsides. Perhaps that’s why the Medic, the class who requires the most teamwork to be effective, gains the least from his regenerating weapon. The Amputator change is either a straight nerf or an oversight. Unlike the other two, the patch notes never even imply the regen wasn’t supposed to remain a straight +3hp/second, and in combat an extra point of regen while taking chip damage is practically unnoticeable. In particular, the old Amputator let you automatically outheal afterburn and other forms of damage over time, while the new one does not. I personally have found no reason to use this weapon with its regen the way it is now. There’s just not enough of it; the old Amputator was my bonesaw of choice since it often saved my life while sprinting in terror from the entire enemy team after a failed push. Couple its pathetic regeneration with the fact that its damage penalty makes it a very underwhelming self-defense weapon, and I have always chosen to rely on my base regen and pick a more combat-reliable melee weapon. But the other two are quite powerful and definitely worthwhile additions to your loadout. They reward players who can win fights by letting them automatically heal up while re-positioning, while punishing players who let a fight draw out too long without landing the kill. Perhaps it’s just because I’m a medic main, but I love regaining HP and can definitely see a host of possibilities opened up by migrating this power to my other classes.